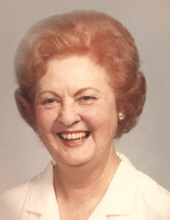 Mary Virginia (Sherrill) Akers, 98, of Paducah passed away at 3:05 a.m. Friday, February 08, 2019 at Superior Care Home. She was a native of Paducah and a member of Broadway Church of Christ where she served as a Bible Class Teacher for 5 year olds. She graduated from Augusta Tilghman High School and attended Paducah Junior College. Mrs. Akers worked in the Credit Department at Paducah Dry Goods Department Store. During World War II, she was a secretary in the Accounting Department for Atlas Powder Company at the Kentucky Ordinance Works. Before retiring she was a secretary for the Federal Land Bank. Mrs. Akers was a former member and officer in the Sigma Phi Sorority. She was a Charter Member and President of the Paducah Parents Group that assisted in forming the McCracken County Cerebral Palsy Center, Now Easter Seals of West Kentucky, and served as volunteer secretary during the center’s first year of operation. She was an original member and past secretary for the Parents Board of Directors at Oakwood Training Center in Somerset, Kentucky. She did volunteer work and supported numerous projects for the mentally handicapped in Kentucky and the residents at Cedar Lake Lodge in La Grange, Kentucky. Mrs. Akers was preceded in death by her husband of 61 years, W.B. “Dub” Akers and her only child, Bill Akers. Her parents were Houston A. and Daisy Talley Sherrill. Funeral services will be held at 2:00 p.m. Sunday, February 10, 2019 at Milner & Orr Funeral Home of Paducah with Mr. Andy Claussen officiating. Private Burial will be held at Maplelawn Park Cemetery. In Lieu of flowers, Memorials may be made to Broadway Church of Christ, 2855 Broadway Paducah, Kentucky, 42001 or to New Pathways for Children, P.O. Box 10, Melber, Kentucky. 42069-0010. To send flowers or a remembrance gift to the family of Mary Virginia Sherrill Akers, please visit our Tribute Store. "Email Address" would like to share the life celebration of Mary Virginia Sherrill Akers. Click on the "link" to go to share a favorite memory or leave a condolence message for the family.